A very Happy New Year to all our members and supporters! 2017 was a busy year for Health Campaigners across the country and we have created a review of 2017 post on our website so you can see what Keep Our NHS Public got up to through the year. Please continue to support us by donating and remembering to renew your membership. We wish you all the best for 2018, especially in your efforts to save the NHS from privatisation. Reports that hospitals have run out of corridor space and an A&E doctor apologising for the 'third-world conditions' in his hospital show that, far from alleviating pressure on the NHS over the Winter period, the Government's underfunding has caused a worse Winter Crisis for the NHS than ever. Dr Richard Fawcett from the Royal Stoke University Hospital tweeted about multiple pressures in his A&E department over the New Year weekend. Patients had been waiting to see an A&E Doctor for up to 12 hours and at one point space ran out for patients waiting on trolleys in corridors. As you would expect at this time of year, our hospitals are extremely busy, but thanks to hard-working NHS staff and robust plans in place to meet winter pressures, they are generally coping. If the departments are coping then this is all thanks to the super-human efforts of the frontline staff, not because they have been properly funded to meet demand. Furthermore, 12 hour waits and running out of space for patients does not sound like coping. NHS in Crisis - Fix it Now! Health Campaigns Together and The People's Assembly Against Austerity have called for a day of protest in response to the Winter Crisis. 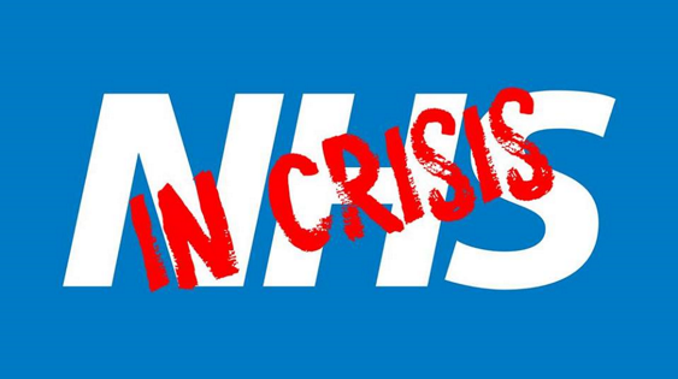 The #NHSWinterCrisis has now descended into a perpetual year-round crisis. A crisis that has brought staff to their knees and patients languishing and even dying in overcrowded waiting rooms and hospital corridors. It doesn't have to be this way. When headlines report there is a 'third-world' crisis in the 6th richest country in the world, let's be clear and call this what it is: an entirely manufactured political crisis by the Tories. Help end the Winter Crisis and urge the government to fund #OURNHS. Head to the Facebook page for more details on how you can get involved. Despite the Government's continual claims that they are not facilitating the privatisation of the NHS, Virgin Care won £1 billion worth of NHS contracts last year. This helpful report from the Guardian shows that Virgin was not the sole private company to benefit with £3.1 billion of health services privatised in 2017. Private firms were awarded 70% of the clinical contracts up for tender in 2016-2017. Ayesha Hazarika speaking on LBC radio provides an excellent and concise resource demonstrating that this Government IS privatising OUR NHS. 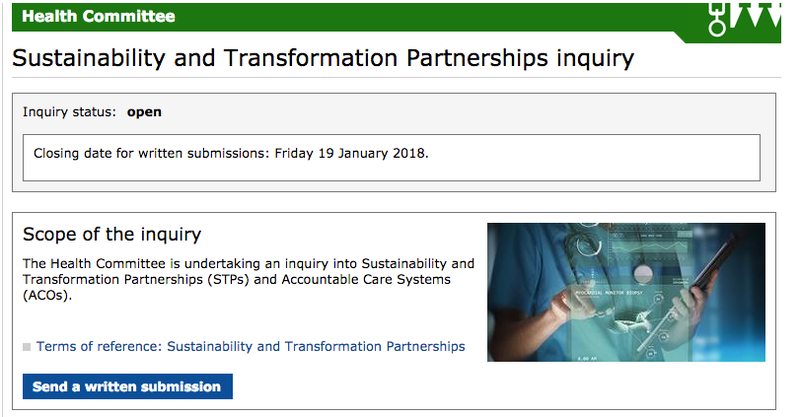 There is a call for evidence from the Commons Health Select Committee, chaired by Sarah Wollaston, on Sustainability & Transformation Partnerships (STPs) and Accountable Care Systems/Organisations (ACOs). Evidence should be submitted by 19th January. KONP will be making our submission. 76 MPs now have signed the pledge and we are hoping to hear very soon from the Shadow Health Team. If you have not yet seen it the pledge (and signatories) is here. Please ask your MP to sign too using this link and make the pledge to take back our NHS. 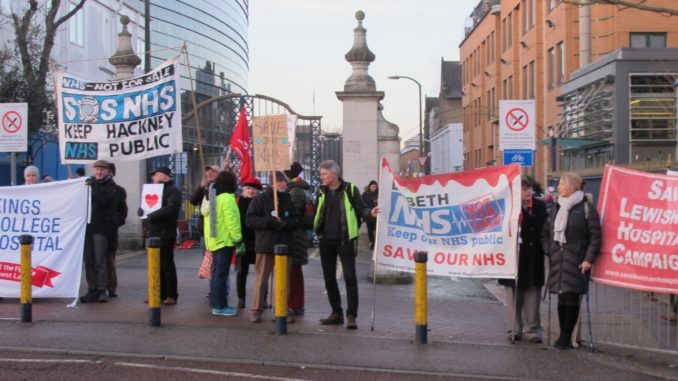 Unite members, staff and campaigners from four London KONP groups demonstrated their condemnation of NHS Improvement's bully-boy actions against Kings College Hospital NHS Foundation Trust outside Kings on Denmark Hill on Tuesday 19th December. The Chair of the trust, Bob Kerslake, resigned on the 11th of December, citing that the trust was not going to meet targets as it was being asked to do the impossible with the funds given. You can read a full write-up of the demo in our post on the KONP website. 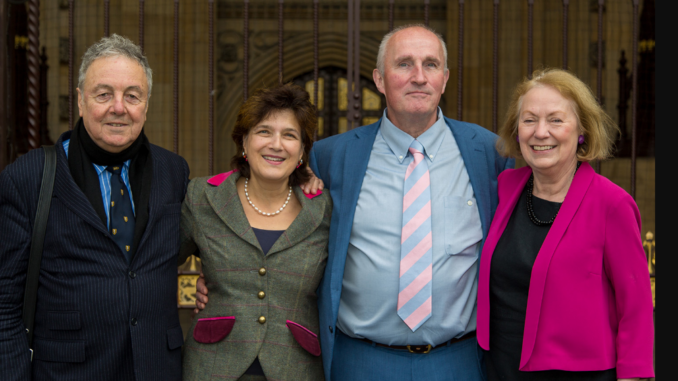 Thank you to all our supporters who have contributed to the magnificent appeal for this judicial review, mounted by ‘The Famous Five’ who are challenging Jeremy Hunt and NHS England on their failure to mount proper consultation, their bypassing of full parliamentary scrutiny and their disrespect for the law. Professor Stephen Hawking joined the appeal at the end of November. The five complainants await a date from the High Court as we enter 2018. Hands off Huddersfield Royal Infirmary have been doing great work in their community. They are launching a judicial review against the Hospital Trust and need your help. Please read their appeal below. 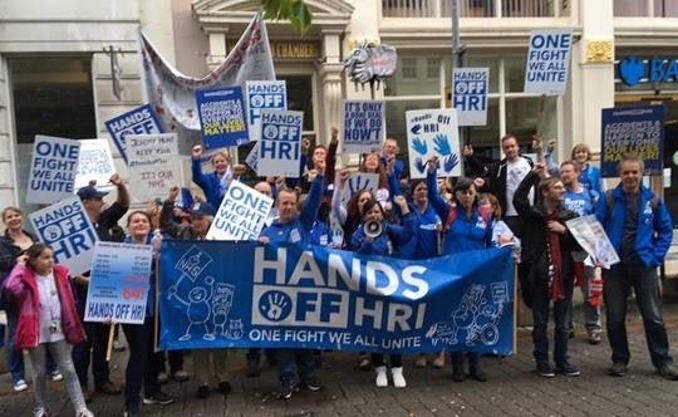 Hands Off HRI is a hugely successful community-based campaign fighting to save our local District Hospital and A&E in Huddersfield. The campaign is now 2 years old and is lodging a judicial review against the Hospital Trust. Our petition is to go to Jeremy Hunt, Secretary of State for Health, who has been asked by local councillors via the Scrutiny process to establish an Independent Reconfiguration Panel to re-examine the entire business case. Mr Hunt has the power to veto these dangerous and damaging cuts...and we need your support to help persuade him. Please sign and share the petition widely and follow us on Facebook or visit our website. After the Unite the Union protest at the imposition of special measures on Kings College Hospital, Unite & London Keep Our NHS Public campaigners joined GMB Union members in their Day of Action protest against ISS who employ NHS staff at The Maudsley Hospital, Denmark Hill, London and at Queen Elizabeth Hospital, Woolwich. They were protesting against zero-hour contracts, basic pay for weekends and no sick pay; a disgraceful way to treat NHS staff. Please head to the KONP Facebook page for more information and a video of union officer, Nadine Houghton, speaking on the issue. KONP Northeast have had a busy 2017 and need your help in 2018 to help them campaign against cuts and cash-driven closures to demand a fully funded, universal, publicly owned and publicly provided NHS. A video round-up of their busy 2017 can be found on their YouTube channel and to join them in their excellent work please head to their website. Richard Branson's Virgin Care company has beaten Lancashire Care NHS Foundation trust to run the county's 0-19 Healthy Child Programme for the next 5 years. The Canary and Vox Political have reported on this. The former quoted Azhar Ali, leader of the labour group on the council, as calling the decision 'privatisation by the back door'. This is yet another example of Virgin's parasitic campaign to take over the NHS. 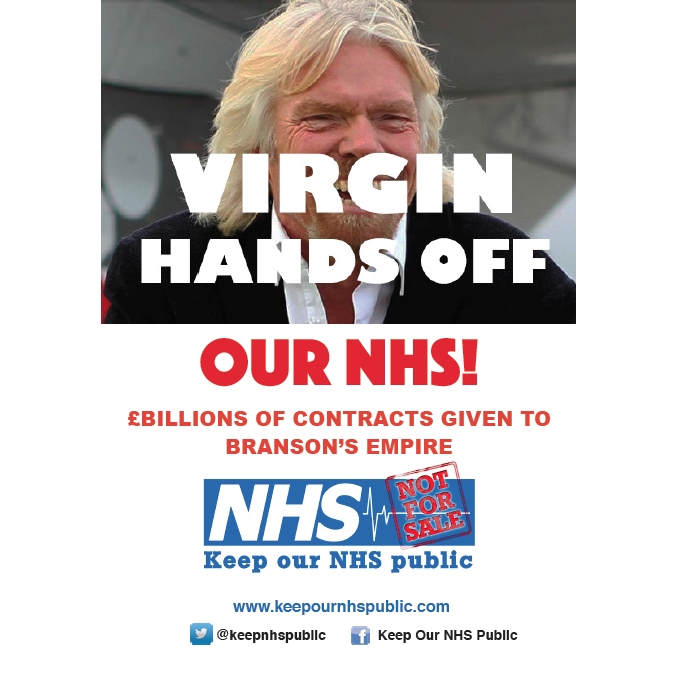 We still have Virgin Hands Off Our NHS leaflets available from the KONP office should you require any. You can order here. Hackney KONP with Hackney Momentum are having an NHS stall in Chingford constituency, which is where Iain Duncan Smith is MP with a small majority. HOLD are calling for a morning of action at the presentation of the results of the recent public consultation on the future of their two community hospitals. Please head to their Facebook page for more details on how to get involved on the day. 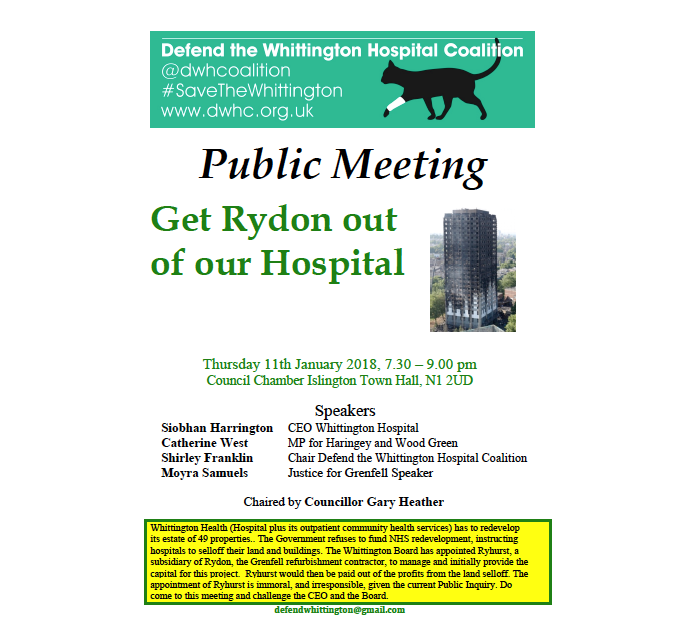 Please come to this public meeting to challenge the CEO and Board about the appointment of Ryhurst, (a subsidiary of Rydon, the Grenfell Tower refurbishment contract) to manage the redevelopment of Whittington Health's 49 property estate. Please see leaflet below for more details. Save the date for the next HCT conference in Leeds. Speakers include John Lister, Alex Scott Samuel and Vivek Kotecha with more information to follow. 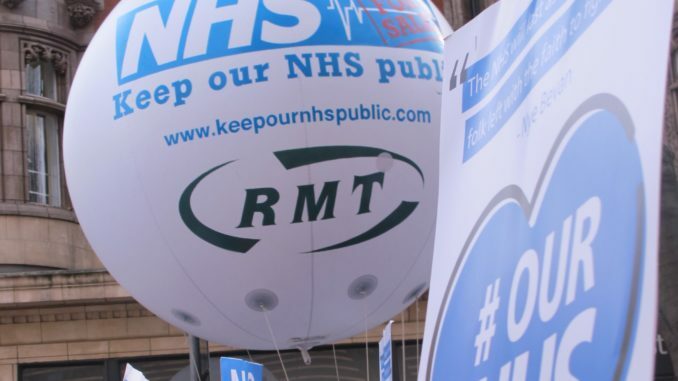 We hope there will be demonstrations nationwide against The Winter Crisis and the underfunding of Our NHS. More details via the Facebook page. Every week we hear about failures in the care services: neglect and ill treatment in residential homes, limited care times and poor service in users' own homes. This is aggravated by the bad working conditions and low pay of carers. In 2016 LESE asked what can be done to support and improve conditions both for service users and service providers. This free Seminar is a follow-on and will outline the problems of the system, point to new ways forward and give participants the opportunity to express their own views. We have plenty of Virgin: Hands Off Our NHS leaflets remaining. If you wish to have some sent to you please head to our online shop, email materials@keepournhspublic.com or call 0207 2714443 (Ext. 210). If you have any queries please don't hesitate to contact the National Administrator, Bri, on the above number. All donations are so appreciated – they help us coordinate our national effort to protect the NHS. Please visit our website to donate via paypal or send a cheque (address in the footer below) or email us to pay by BACS.